Search Engine: You know that when you search on Google for a certain topic, you get the best match for the query you're searching for. In addition, Google's ads are always displayed separately so that you're sure the results are the best match and not the ones backed by payments. Question Answer Tool: Have you tried Wolfram Alpha? If not, you should. While Wolfram Alpha's mathematical capabilities are more elaborate, Google is bridging the gap slowly every day and you can ask it certain questions and you'll get live answers and conversions, which we'll cover next. Before we dive in, if your website's services or products or brand name do not show up in Google in one way or another, it's time for you to invest in a professionally made website. Your business is literally losing money everyday. Stop whatever you're doing now and get in touch with us to get started. We define a static unit conversion as one that doesn't change over time. For example, converting Pounds into Kilograms or Celsius in Fahrenheit. All you have to do to get your answer is open Google and type one of the following queries. 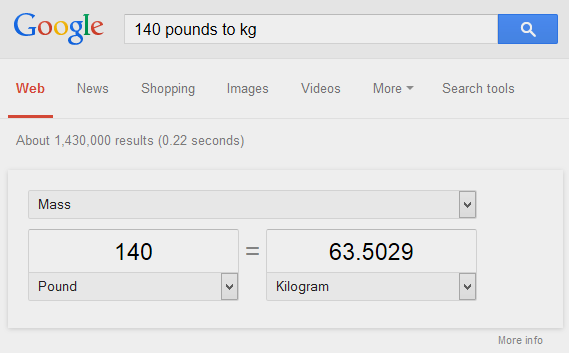 Google will display the result and also add input fields so that you can change the input and the units more easily. Dynamic or live units on the other hand, as we see them, are ones that change over time. 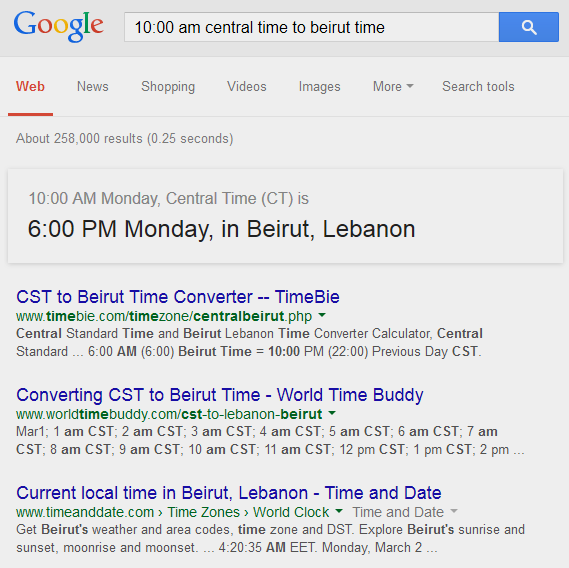 For example, currency conversions or even timezone conversions. Keep in mind that timezone conversions might not give the same results depending on Daylight Saving Time (DST) in both the origin and the result timezones. Here's where Google gets more useful. Let's say you have to attend a webinar at "10:00am Central Time" but have no idea how that translates to your current local time. Pop the below query into Google and you'll get the answer right away. Notice how simple and how human and easy to remember the query is. You can also use Google for live currency conversions or to get the current weather in a certain location. Try those queries for example and you'll get your answers in addition to extra valuable info. Well, Google is your friend. It's becoming more and more useful every day and it's always best to test your query or question in Google and then go from there to delve into the details whenever needed.